Last week, I finished The Interestings, which was an absorbing, funny, thoughtful character study. And even at 500+ pages, I didn’t want it to end. Next, I read Kate Scott’s YA debut, Counting to D. It was heartfelt, and it taught me a lot about dyslexia–a learning disability that I only thought I understood until I read this book. Also, there was a scene involving VooDoo Doughnuts. Yes. Now I’m reading TransAtlantic–I loved Let the Great World Spin, so I have high hopes for this one! I’m not drafting or revising at the moment, but I’m in the middle of a lot of research. Instead of writing page-count goals, I’m giving myself deadlines for working through various resources. I’d love to start writing this WIP next month, but I have a lot of books to get through first. I’m getting really excited for ALA Annual! I’ve never been a library conference before, and I’ve also never been to Vegas. The Class of 2K14 has a fun trivia event planned, with Jay Asher and Josephine Angelini as our moderators. And then I’ll be signing in the Sourcebooks booth. After ALA, I’m heading back to the Midwest to visit some family, and I can’t wait to see my nephew. When I last saw him, he was a newborn–and now he’s almost eight months old! Getting back into running, making homemade ice cream (spicy chocolate was my last concoction), and enjoying the warm weather and sun. 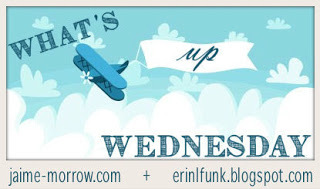 What’s Up Wednesday is a weekly meme that helps readers and writers touch base with blog friends. You can find the link widget (and cute buttons!) on Jaime’s and Erin’s blog posts. Spicy chocolate ice cream sounds yum! Your homemade ice cream sounds amazing! You’ve reminded me that I really need to use our ice cream maker this summer. We’ve got all these awesome recipes for it, but summer ends up being so busy that I always forget to put it to good use! I hope the spicy chocolate ice cream tasted as delicious as it sounds! Good luck with getting your research done before next month! Congratulations on your second novel being sold, Rebecca! You know this means you have a career, now. 🙂 Seriously, I really wish you all the best, and the time at ALA is as much fun as you expect–even more.